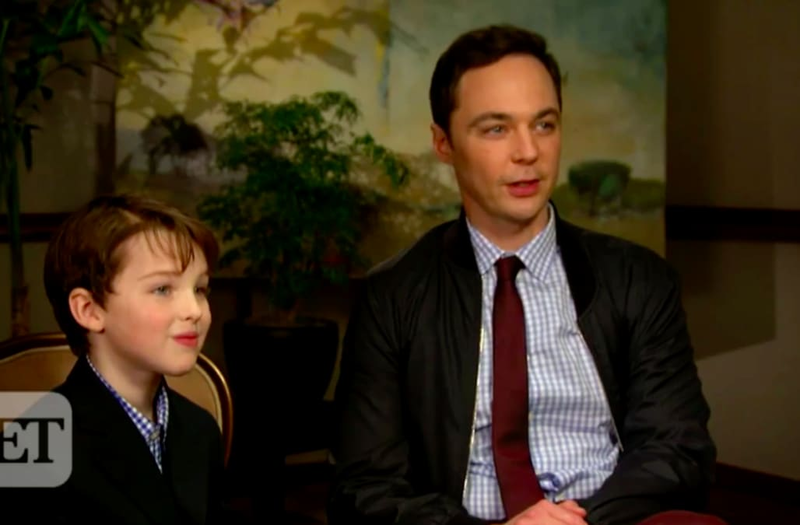 Jim Parsons and Young Sheldon star Iain Armitage are like two peas in a pod. The actors play the same character, Sheldon Cooper from The Big Bang Theory, just 30 years apart. Parsons has played the part for 10 seasons now, while Armitage is taking on the character's origin story in CBS' new sitcom this fall. ET's Nichelle Turner spoke with the two during the summer Television Critics Association press tour, where they had nothing but great things to say about each other. RELATED: First Look at 'Big Bang Theory' Spinoff 'Young Sheldon' -- See the Pics! Parsons and Armitage have been spending a lot of time together while filming the new series -- on which Parsons serves as an executive producer -- including seeing a performance of the Broadway musical Come From Away in New York in May. "You had so many more people recognize you in the theater than recognized me," the 44-year-old actor told his mini-me. "They love you there." "Not true," Armitage chimed in, but Parsons insisted. "That is true. And it's not just because you wore tap shoes and they could hear you coming." The idea for Young Sheldon came about while Parsons was working with husband Todd Spiewak, his "partner in life" and partner in his production company. "We had been asked by [CBS] executives, 'Would you look into your own life? Because those pitch well,'" Parsons explained. "So we were looking at my family and one of my nephews, my sister's kids, her oldest, he's very smart. Not like in a Sheldon way, but they frequently say, 'Where did he come from?' So we were like, this sounds like a good idea. And the more we talked -- they're in Texas -- and it was, like, this relates." "I mean, you could be talking about a young Sheldon here," he continued. "So I wrote Chuck [Lorre] and was like, 'Listen we have this idea. It also sounds like this. If this interests you and you want to look into this together, let's chat. If not, we can go on our merry way and change it enough that it doesn't relate as much.' But Chuck loved it and Steve Molaro loved it. And what they've done with it, in making it a single cam, and the way that they've opened this up, it's beautiful -- even more than I could have dreamed of." TV viewers first got a real glimpse at the 9-year-old Armitage starring as Shailene Woodley's son, Ziggy, in the Emmy-nominated HBO drama, Big Little Lies. "So is that like, in your contracts? I only work with Oscar winners and big time actors?" Turner asked Armitage. "Yeah, it's actually on page 29, section B," he joked. "No, I'm just kidding. I've just gotten really, really, really, really, really, really, really, really lucky." So how did the 9-year-old rising star land the role? "On tape. He taped himself," Parsons shared. "His mother taped him at his grandmother's house over Christmas. Chuck and Steve wrote this ridiculously long, complicated monologue, which was not in the script. I think it was kind of a trial by fire thing -- we don't know if we're going to write this long for this character, but they need to be prepared for it." On “The Big Bang Theory,” Kaley Cuoco is Penny Hofstadter, wife of Leonard. Currently a pharmaceutical sales rep, Penny moved to Los Angeles to become an actress, but never got her career in show business off the ground. Cuoco is one of the highest-paid actresses on television, behind only Sophia Vergara of “Modern Family,” reported Forbes. Cuoco has a net worth of $45 million. Since season eight, she has earned $1 million per episode of “The Big Bang Theory” to play Penny, a leap from her previous salary of $350,000, reported Deadline.com. Additionally, her work on the show has earned her a Critics’ Choice Award and a People’s Choice Award. Jim Parsons is Dr. Sheldon Cooper on “The Big Bang Theory.” A theoretical physicist who enrolled in college at the age of 11, Sheldon finds himself to be the perfect human, but his seriously eccentric personality makes him a bit difficult for others to handle. In the Oct. 10 episode of season 10, Sheldon finally decides to move in with long-time girlfriend Amy. Sheldon is the biggest role Parsons has ever played, but it’s certainly not the only one. He previously appeared on the series “Judging Amy,” lent his voice for Oh in the animated film “Home” and appeared in “Wish I Was Here,” among other projects. Penny’s husband, Dr. Leonard Hofstadter is played by Johnny Galecki. Best friend and former roommate of Sheldon, Leonard is a bit less socially awkward than the rest of his geeky pals and constantly finds himself stuck explaining Sheldon’s peculiar behavior. Galecki earns $1 million per episode for his work as Leonard on “The Big Bang Theory.” Along with Cuoco and Parsons, he renegotiated his salary to its current rate from $350,000 prior to season eight. In total, Galecki’s net worth is $50 million. Howard Wolowitz is played by Simon Helberg. Prior to settling down with his now-wife Bernadette Rostenkowski, the aerospace engineer considered himself to be quite the ladies’ man. Until she passed away in season eight, Howard had a seriously overbearing mother who tried to control him. Helberg’s net worth is $45 million, and he earns around $750,000 per episode of the CBS sitcom, reported Deadline. In addition to serious monetary gains, he also won a Critics’ Choice Award for his portrayal of Howard and has received numerous Screen Actors Guild Award nods. Better known as “Raj,” Kunal Nayyar is Dr. Rajesh Ramayan Koothrappali on “The Big Bang Theory.” For the first six seasons of the show, the astrophysicist suffered from the social anxiety disorder selective mutism, which made it impossible for him to talk to women he wasn’t related to. Nayyar is paid a salary of about $750,000 per episode to play Raj, which has brought the actor’s net worth to $45 million. “The Big Bang Theory” has proven to be a lucky break for the actor — he picked up the role just a few years into his career. On “The Big Bang Theory,” Mayim Bialik is Dr. Amy Fowler, Sheldon’s girlfriend. A Harvard-educated neurobiologist, Fowler met Sheldon in the season three finale and has been dating him on-and-off ever since. Bialik’s net worth is $12 million and she reportedly earns $100,000 per episode for playing the part of Amy, according to numerous media outlets. Earlier this year, the actress told the NY Daily News that she, Cuoco and other cast members were overpaid. Parsons admitted that producers saw "so many tapes" that "were all good in different ways," but he explained that Armitage's audition had something special. "Iain's was mind-blowing in some ways. It's true," he said. "There was a naturalness with it and a spirit with it, and an understanding of what..."
"Now you're just being kind," interrupted Armitage. "I am not kind. I'm a nice person but I'm not kind when it comes to those things. I would just not say anything if I didn't like it," Parsons insisted. Throughout The Big Bang Theory's 10 seasons, Parsons' character has often spoken about his childhood and his upbringings. To created the storyline for Young Sheldon, the writers looked back at those episodes to see how they will incorporate those stories. "I know they're doing that when they're writing it," Parsons told ET. "We did a panel today and Steve Molaro was talking about -- the two things he brought up, he brought up the uranium that Sheldon buys, and he brought up the Halloween where Sheldon made his sister push him around in [an] office chair! With a speaker thing attached to his chest so he could be Steven Hawking, but everybody thought he was R2D2." For now, Armitage has just had a blast taking on the role, which Parsons calls "inspirational to watch." "You are having fun and it's been really inspirational to watch," he told his young doppelganger. "There's just a way in which he's tackling all this that is so such fun and such joy of the process... You're a reminder to, I think, anybody who's been doing it for a while to [see] how much fun it is." Young Sheldon premieres after The Big Bang Theory's season 11 return on Monday, Sept. 25 at 8:30 p.m. ET/PT before debuting in its regular time slot Thursday, Nov. 2 at 8:30 p.m. ET/PT on CBS.